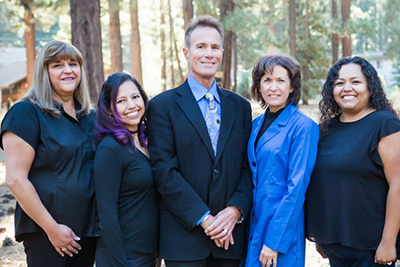 Dentures – Tahoe Family Dentists - Providing excellence in dentistry in South Lake Tahoe. Dentures can restore your speech, ability to eat many foods, as well as provide a positive self-image and confidence. If you have lost several teeth (or all of the teeth) in one or both arches, dentures may be the best option for you to resume your normal activities. Our dental office in South Lake Tahoe creates many different kinds of dentures for patients to help them regain functionality and self-confidence. Partial dentures are similar to bridgework, but can be removable. A partial denture can replace one or more teeth in a row, or several teeth at different places along the arch. Upper partials may have an upper bar/strap or a plate similar to full upper dentures, while lower partials usually are supported by implants or metal attachments such as a bar. Full dentures are created for patients when all of their natural teeth in an arch have been lost and / or removed. Full dentures may consist of an upper denture, a lower denture, or both. Upper dentures fit along the upper palate, while lower dentures fit around the arch of the gum with room for the tongue to move freely. Both types are frequently constructed as immediate dentures to replace extracted teeth on the same visits so that one is never seen without teeth. Dentures are the alternative to ongoing dental work in a mouth full of compromised, severely damaged, or rapidly deteriorating teeth, or for patients who are edentulous (toothless) due to decay, gum disease, and tooth loss. If you need any extractions, denture construction usually will be completed before the teeth are removed. The dentures will be fabricated by the dental lab to fit comfortably in your mouth. Full dentures will have a soft plastic base on which the replacement teeth are mounted. These dentures can be removable, or mounted on dental implants placed in the jaw. Partial dentures may also be supported by implants rooted in the bone of the jaw, or by metal attachments to surrounding teeth. Partial removable dentures can be taken out for oral care and at night. Several appointments are usually needed in our South Lake Tahoe dental office to create and refine your dentures, and regular refitting or reline may be needed as the inside of your mouth changes over time. You will still need to keep your biannual appointments at the dentist to have your dentures and gums checked. You should always tell your dentist if your dentures are uncomfortable, as an adjustment can often resolve the issue. You can expect some extra salvia production and mild soreness for the first few weeks after receiving dentures while your mouth and jaw adjust. Your dentist will explain denture care and maintenance to you. please call our office at (530) 541-1353 to schedule an appointment!